Kevin Ochoa’s family is getting unusual help in answering a vexing riddle: Why is he having so much trouble breathing? The Des Moines sixth-grader suffers severe asthma attacks, which routinely send him to the hospital. The situation is frightening, painful and expensive. Last week, a team of experts came to his south-side home to help figure out if something there was triggering Kevin’s lung spasms. “You spend so much time in your home, and if it’s not healthy, you can’t stay well,” said Claire Richmond, project manager for the group Healthy Homes Des Moines. The project’s supporters include Polk County and the city’s three main hospital companies, Mercy, UnityPoint and Broadlawns. The goal is to find and fix household problems that contribute to childhood asthma. The effort began last July as a pilot project in a neighborhood north and east of downtown Des Moines. It now is spreading throughout the city. The goal is to help 150 families over two years. Kevin’s mother, Jessica Ochoa, has lost track of how often she’s taken Kevin to the hospital for asthma attacks over the past year. “Probably five or six times,” she said, standing in the family’s living room last week. Every time Kevin goes to the hospital, doctors and nurses examine him, listen to his wheezing lungs and put him on more drugs. The most intense visit came late last month, when an ambulance rushed Kevin to Blank Children’s Hospital. He stayed there nearly three days, including a stint in the intensive care unit. “It seems like the older he gets, the worse it gets, which is frustrating because it’s supposed to be something you outgrow,” his mother said. After Kevin was released from the hospital, Jessica received a call and an unusual offer. 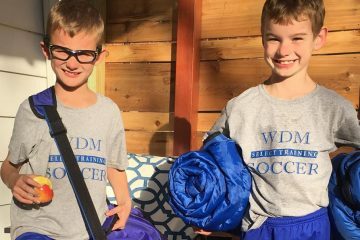 Healthy Homes Des Moines wanted to send experts to the family’s home to look for possible issues that could be compounding Kevin’s asthma. Ochoa agreed immediately. A building inspector from the Polk County Health Department and a community health worker from Visiting Nurse Services arrived last week. They walked through the house, looking at carpet, bedclothes and basement walls. They looked for possible sources of mold, dust or mites. The experts asked whether anyone in the house smokes. The parents said no, which was good news. Then the visitors asked where the Ochoas’ dog, Harley, slept. The answer: In Kevin’s bed. The experts’ response: Harley needs to sleep somewhere else. The building inspector checked out a crawl space under the bungalow’s bedrooms. The crawl space has a damp, dirt floor, and the area wasn’t well sealed. A contractor would be sent over to seal it up. The team also agreed to have the carpet in Kevin’s bedroom ripped up and replaced with a hard laminate floor, which would be easier to clean. The team also decided to install a drain system along basement walls, to repair a water leak under the kitchen sink and to reroute the exhaust from a bathroom fan. And it would give the family a year’s supply of furnace filters, a special vacuum cleaner and a mop that uses steam to deep-clean floors. In all, the work and supplies would be worth nearly $10,000. That sounds like a lot, but it could easily be offset by savings if Kevin can avoid future hospital stays, said Richmond, the project organizer. Kevin’s care costs are covered by Hawk-I, a public health insurance plan for children of moderate-income families. His expenses can easily run into the tens of thousands of dollars. The two-year program has an $866,000 budget, with money coming from the county, area hospitals and several foundations. 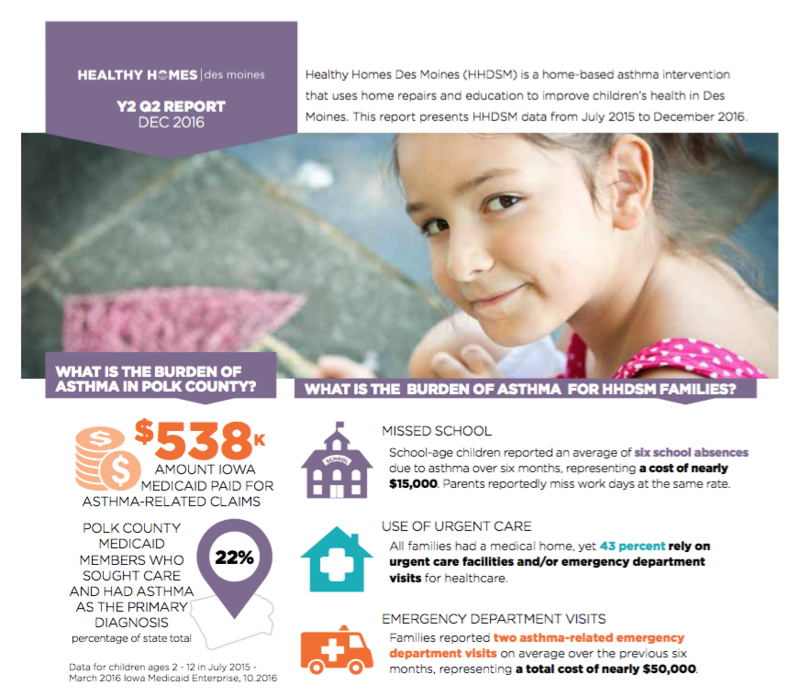 Des Moines children with asthma may qualify for free home inspections from the group Healthy Homes Des Moines. Organizers say the best way to get in touch with the program is to ask for a referral from a physician or a school nurse. To qualify, families’ incomes must fall below 80 percent of the area’s median income. For a family of four, that level equals about $60,000.